Following Vietnam there were no parades, no welcome home except from loved ones, no "job well done." 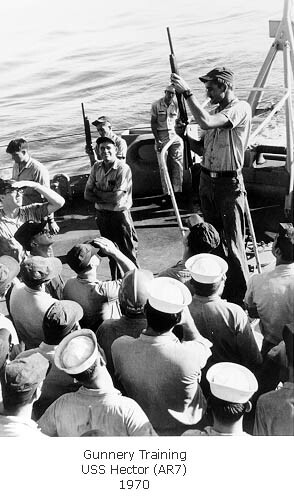 Instead a bitter, disillusioned peer group didn't want to acknowledge a sailor's sacrifices. 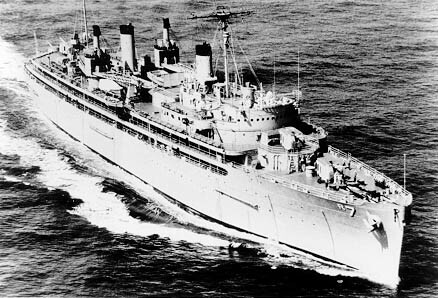 I still had a year to go in my enlistment and was ordered to report aboard the USS Hector (AR-7), which was to embark for Asian waters almost immediately after I reported aboard. I was not mentally prepared to return to the orient. 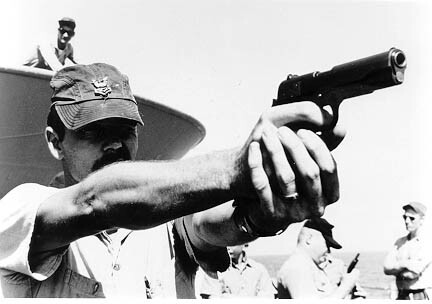 At sea on the long boring trip to Sasebo, Japan, I conducted small arms training for the crew. 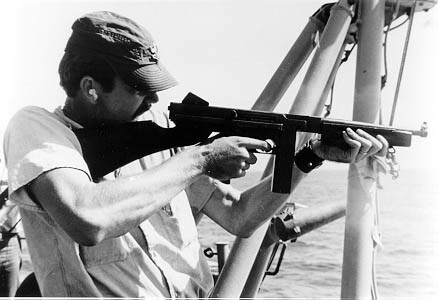 I was not suited for regular Navy duty after being on the boats and kept to myself in ammo and powder storage areas or in any of the four 5" mounts on the ship or played Acey-Duecy (a backgammon type of game) with GMG1 Evans. After brief stops in Taipai and Hong Kong, we visited Vung Tau in Vietnam to effect repairs on some of the mother ships for the boats. Even Repair ships (USS Sphinx ARL-24) need repairs. That's her on the port side foreground (above) with another unidentified smaller ship outboard. On the starboard side is the USS Benewah APB-35, my home away from home while on river boats a year earlier. Other unidentified ships are outboard from the Benewah. 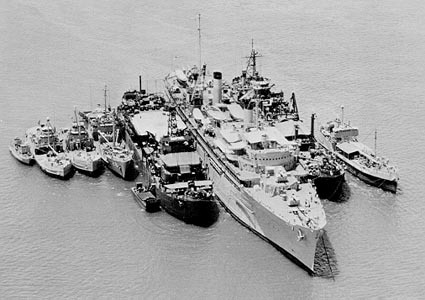 These ships were repaired and resupplied from the Hector on our visit to Vung Tau in June or July 1970. Here's another shot of the Hector with the Benewah, Sphinx, and several other ships along side. The photo on the right is of the Benewah coming up alongside. 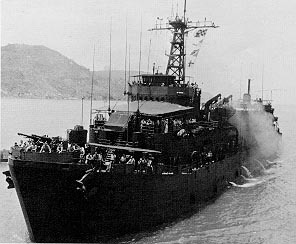 The Benewah left Vietnam in November 1970. 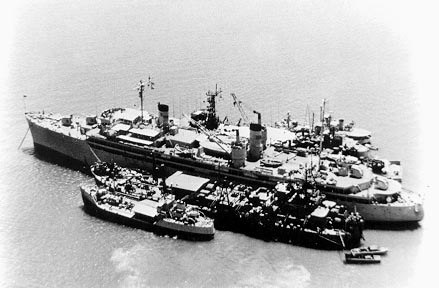 The Hector returned to Sasebo, Japan after visiting Vung Tau. Following our return to Sasebo, I sent for my wife and we lived in a small Japanese house just above the harbor area. We enjoyed our time in Japan and had our first taste of Sushi. Failing to appreciate it then, we now love it and eat it often. 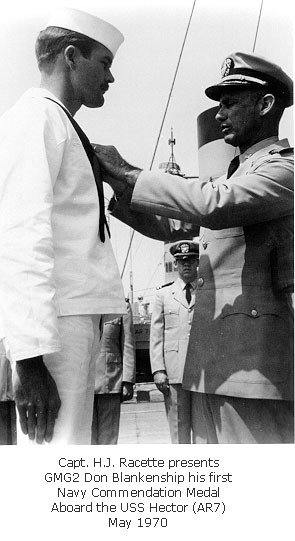 Following our return to the US, I left the Navy in April 1971 after my 3 years and 9 months of active duty. We moved back to Oklahoma City so that I could finish college where I had started. I was able to obtain an MBA degree thanks to the GI Bill and have had a career in commercial real estate I returned with my wife and 3-year old daughter to San Diego in 1977 and we have lived here ever since. I'm now a proud grandpa with five grandchildren that I help raise. Life goes on... even though I still grieve for those we left behind who gave their all. And I continuously harbor a great deal of guilt for being able to live my life when so many others died in the spring of their lives... not knowing the happiness of raising a beautiful daughter, or the joy of a grand child's laughter or the loving hugs of a wonderful wife. I have shed many tears thinking of those sacrifices made by young men and women who died in Vietnam and did not receive the grateful appreciation of the nation. I will continue to think of them often until I'm gone. For more information about the USS Hector (AR-7), here's a link to the USS Hector Web Site.